Enforced 9 a.m. - 5 p.m., Monday - Saturday. Parking is free every day after 5 p.m., and all day Sundays and holidays. Payment for on-street parking is available via meter or pay station. Rates are $1/hour. Meters accept coins, (except pennies), Visa, Master Card, and Discover. Progress & Church Street lots have a four hour limit; all other parking has a two hour limit. Parking beyond the maximum time limit is prohibited and strictly enforced. The expired meter fine is $35. Permits are required Monday – Friday, 7 a.m. - 5 p.m., (Drillfield from 7 a.m. - 8 p.m.), unless otherwise noted. Permits are not required on evenings after 5 p.m., weekends, or in metered spaces. Regulations are in effect when the university is open, including during semester breaks or when classes are not in session. Visit www.parking.vt.edu for more information and special event parking. Numerous private lot owners employ towing companies to patrol their lots. Most of these lots have contact information posted. Vehicles towed by the town can be retrieved by contacting the Blacksburg Police Department at 540-443-1400. Bicycle racks are available throughout downtown. 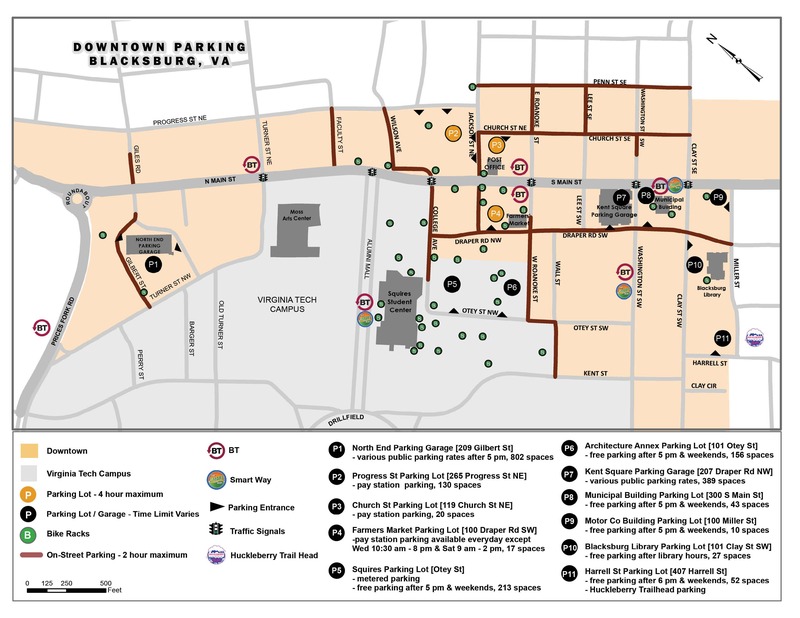 For more information visit www.blacksburg.gov/parking or email cro@blacksburg.gov.